In 2013 Gallimard, one of the biggest publishers in France, invited Steve Jackson to the Salon du Livre, France's huge annual literary trade fair. Gallimard had been publishing Steve's books non-stop for the last 30 years; it was about time he made the guest list. I met Steve there, and pushed a copy of my gamebook Arcana Agency: the Thief of Memories into his hands. I also tried to hustle for a little writing work, even talking about some storylines for wholly original Fighting Fantasy apps. Steve was very polite and professional with me – though in retrospect, I was a bit pushy and over-eager. I'd already had a little email contact with Steve; he very kindly said it would be okay for me to send him a more fully-developed proposal. I got to work. 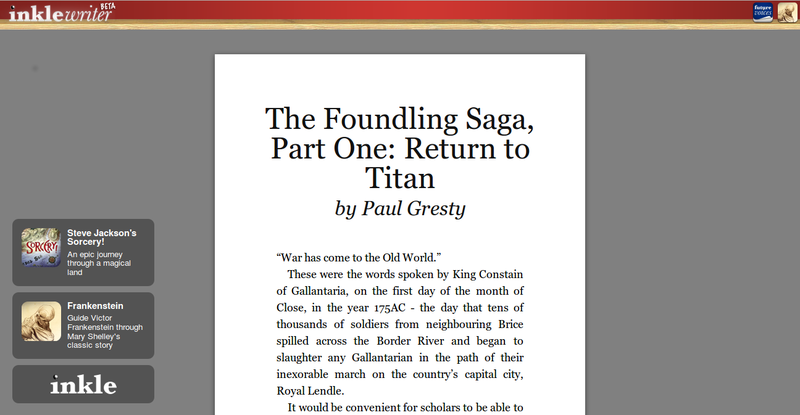 The proposal I ultimately sent him was for The Foundling Saga, a story taking place in Gallantaria during The War of the Five Kingdoms. I prepared a comprehensive outline, and even went so far as to create a demo of the first part of the game using Inkle's excellent Inklewriter engine. One idea I particularly liked was the notion of an app that could be played in the second person – gamebook-style, recording stats and items – or in the third person, in a more literary style. I still feel there's some merit to that idea, even given all the extra development work it entails. Steve didn't go for the proposal. In truth, I'm not sure he really even read through it – he mentioned it would have been difficult contractually, so it probably wasn't worth a great deal of attention. Plus I got the impression the idea just didn't grab him, and he was being diplomatic. But he was very cool with me throughout. The guy's a pro, and it's a crying shame he hasn't written any gamebooks for a while now. So I think I'm never really going to do anything with The Foundling Saga; it is now and forevermore relegated to the status of fan-fiction. 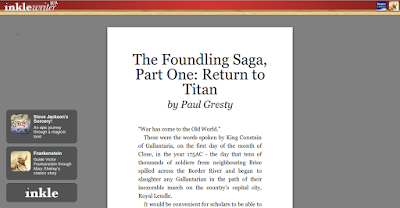 Feel free to take a look at the online playable demo I prepared for The Foundling Saga, Part 1: Return to Titan. It's a nice little gamebook in its own right, I feel, copyrighted names and places notwithstanding. Pfft. You win some, you lose some.